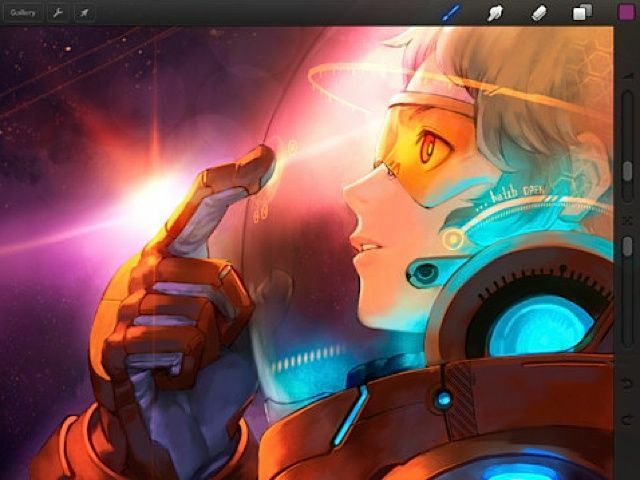 This is one of the “best apps to create art work close to traditional media,” he says. He demos by splashing some yellow and red across his iPad, then uses the palette knife tool to blend across what looks like dimpled drawing paper. You can control the pressure of the brush, use thinner and control the loading of the paint on the brush, and there’s no mess or wasted paper, either. The watercolor canvas takes the “paint” just like real watercolors, each one bleeding into the next. 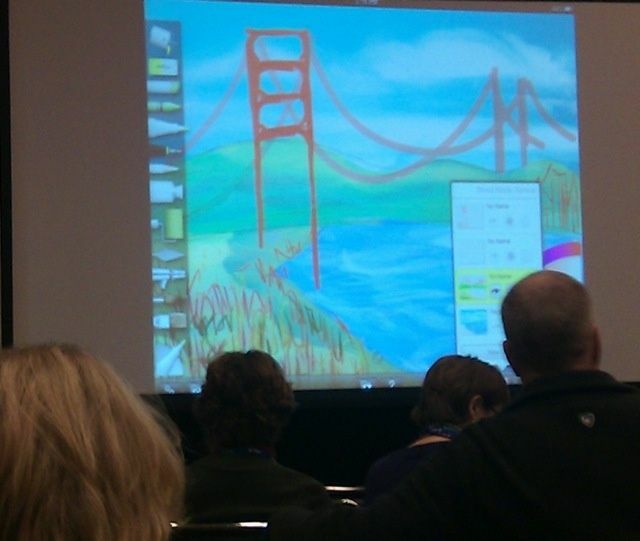 Sumit Vishwakarma’s quick demo with ArtRage. If all of this sounds like a lot of work, Vishwakarma suggests a shortcut that takes of an iPad advantage: working in layers. In about 15 minutes with this app, you could get a lush still life by sketching a pear, then duplicating it. That same pear can be made smaller, poised on its side, perhaps given a few rotting bruises a la Caravaggio. He used the same technique to copy the impressionistic streetlamps from one side of his “Rain Walk” work to the other. The app also allows you to work with Photoshop, importing or exporting the image with the composites intact. This is his go-to app for a minimalist interface and brushstrokes that change with the speed of your hand. He draws a quick cartoon with a black brush that makes Picasso look like child’s play. Photo apps plus art apps are the best way to pump up your work, he says. There are some amazing art mashups you can’t always get by painting, including hexagonal work in the glove in his Spiderman portrait. Finally, get your art off the small screen and into real life with this Autodesk app. It allows you do bump up the size to 200 gigabytes 200 MB, making it easy to bring it into the real world with your friendly local printer.